One of the main differences between composite hockey sticks is the composition of material used in the manufacture of the stick. The hockey stick materials commonly used are carbon fibre, fibreglass & aramid. 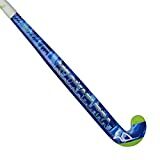 This page of our site groups together the best hockey stick reviews by carbon fibre content as the sticks with higher carbon fibre content are widely regarded as the best, though read our hockey stick review pages carefully as it really depends what you are looking for.